Al-Qaida and ISIS bookmark a fifteen-year era of global conflict marked by western hubris and failure. 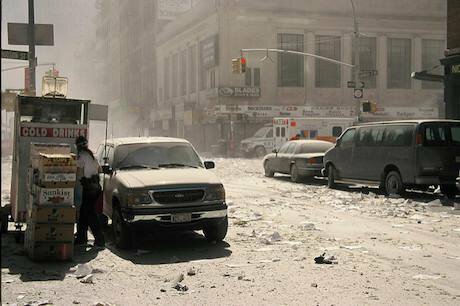 Chambers Street, New York, 11 September 2001. David Farquhar/Flickr. Some rights reserved.These weekly analyses started immediately after the attacks in New York and Washington on 11 September 2001, and as this is the seven-hundred-and-fiftieth column it is perhaps appropriate to reflect on developments in what was soon called the 'war on terror'. In the wake of 9/11 there was widespread support across western governments for strong military action against al-Qaida and its Taliban hosts in Afghanistan, although from the start there were voices expressing another view. The first column in this series warned that the atrocities should be seen as a provocation by al-Qaida to drag the west into a long drawn-out war in central Asia. Oxford Research Group published a longer report along the same lines (see "The United States, Europe and the majority world after 11 September", ORG, September 2001). "[The] only response that will really contribute to global security and peace is for Washington to address not the symptoms but the roots of terrorism. It is for the United States to re-examine and substantially change its policies in the Middle East and the Third World, supporting for a change arrangements that will not stand in the way of the achievement of equity, justice and genuine national sovereignty for currently marginalised peoples. Any other way leads to endless war." Such views got nowhere at the time, the war went ahead, and in late January 2002 – after the Taliban had been dispersed – George Bush used his state-of-the-union address to Congress to declare an extension of the war to an “axis of evil” of rogue states, with Saddam Hussein’s Iraq heading the list. The long-planned termination of that regime started fourteen months later and within six weeks seemed, like Afghanistan, to have been a great success, with Bush’s “mission accomplished” speech on 1 May 2003 celebrating the end of hostilities. The war on terror appeared to have been won. Instead, complex wars ensued in Afghanistan and Iraq with over a quarter of a million people killed, yet there have been periods when the devastating conflicts seemed to be diminishing. In 2009, for example, the incoming United States president, Barack Obama, could begin to carry out his campaign promise of getting US troops home from Iraq, and in 2011 the killing of Osama bin Laden appeared to confirm that al-Qaida was finished. At the same time, the Arab awakening was seen initially as promising a new era for the Middle East, but it led rapidly to a bitter war and a disastrous non-peace in Libya, severe and brutal repression of dissent in Syria, and further deep divisions in Iraq with a marginalised Sunni minority. Syria and Iraq then provided the opportunity for a revitalised al-Qaida in Iraq (AQI) to reinvent itself and proclaim a new caliphate – Islamic State, or ISIS – which took control of a population of around six million in a proto-state that sought continual expansion. It went on to establish an offshoot in Libya with its own territorial ambitions and developed links across west Africa, the Sahel, Yemen and even Russia's Caucasus. Within months, that brought the west back to war in the Middle East. Since August 2014, 20 months ago, some 10,000 air-raids have killed 28,000 ISIS supporters (see “After Brussels: understanding and countering ISIS’s strategy”, IISS Strategic Comment, March 2016). In this period there have been intermittent reports that this new manifestation of al-Qaida was in retreat, for example after losses in Kobane and Ramadi, or in light of the Paris and Brussels attacks, which are claimed to be desperate reactions to these setbacks on the ground. 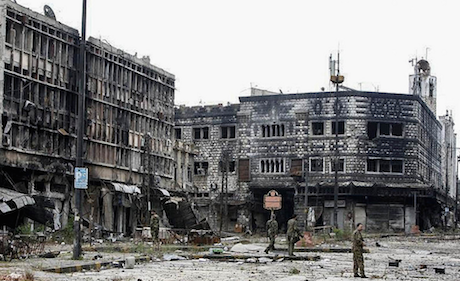 Destruction in Homs, Syria. Khaled al Hariri/Flickr. Some rights reserved.Looking back over these fifteen years it is extraordinary how often western leaders have stated that the end is in sight and that just some more military effort will bring success. Every time, the optimism is soon blighted – yet the official mantra ('there is no alternative') persists. The current period is hearing the same blithe reassurances, though a recent column in this series argued that the European attacks demonstrate ISIS's global prowess, its ability to stir up anti-Muslim bigotry and attract more adherents from the margins, and its capacity to extend the war from the Middle East directly to countries it accuses of killing its people (see "After Brussels, ISIS's strategy", 25 March 2016). There is, though, an even more important dimension. It was reported in that earlier column that ISIS had been preparing this change in strategy for over a year. It now appears that the planning goes back much further, with the building up of cadres of potential attackers over several years (see Rukmini Callimachi et al, “In Europe, ISIS sowed its seeds”, New York Times, 30 March 2016). If ISIS's change of strategy predates the western military response to its advances – and is not at heart a response to the reversals since the air-war started 20 months ago – the implications are chastening. What this means is that the ISIS planners had worked out in advance how the west would respond to its rapid expansion, and were far less fixated on the geographical creation of a territorial caliphate than was supposed. From the start, it would seem, ISIS recognised that there would be a strong and sustained response and that they would face very many casualties. Because of this expectation, resources were being put into the planned war in Europe and elsewhere some years ago. This may seem far beyond what one would expect unbalanced extremists to be able to do, but one of the most consistent problems with western analysis has been a serious underestimation of the intellectual resources embedded in the creation of ISIS strategy. On reflection this should hardly be surprising – ISIS paramilitary leaders have many years of fighting elite western forces, mostly notably in the shadow war against JSOC in Iraq from 2004 to 2008. 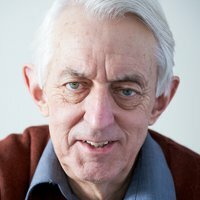 Moreover, the last decade's experience itself builds on an earlier quarter of a century of paramilitary combat in Afghanistan: against the Soviets in the 1980s, alongside the Taliban against the Northern Alliance warlords in the 1990s, and against American forces in the early 2000s. It is this hard, determined background, coupled with a religious intensity that transcends this earthly life, that makes the current war so robust and difficult to counter – so much so that it is probably not amenable to a military solution at all. If that view is not acceptable in western capitals, neither is the scale of investment required to nurture the alternative to military control. Part of that alternative lies in countering the underlying poverty of ISIS's religious vision, and can only come from within Islam; but the other part is addressing the reasons for the alienation and marginalisation of so many young people across the Middle East and beyond. The latter certainly does require sustained western involvement, though of a very different kind than the military approach of the last fifteen years. Rather, it means taking to heart the views expressed by Walden Bello amid the post-9/11 fallout. In the unlikely event of this series of articles surviving another five years until the thousandth is published, some time in 2021, my fear is that we still will not have made that transition.